Hardcover - $30us, $30au, $30nz, 30eur, 20# - Shipping weight approx. 2 kg. Note: Hardcover copies are a limited edition with only 1500 copies worldwide and are signed by the author. 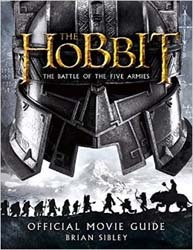 As The Hobbit movie trilogy moves toward a spectacular climax, experience first-hand how the epic filmmaking battle was won through exclusive interviews with director Peter Jackson, Ian McKellen, Richard Armitage, Cate Blanchett & Christopher Lee, together with principal filmmakers and new cast, including Billy Connolly as the Dwarf Dain Ironfoot, and Benedict Cumberbatch, who divulges the dark secrets of playing the evil Necromancer. Illustrated with hundreds of behind-the-scenes photos of the actors, creatures, sets and locations, together with concept art and numerous special effects shots, this is the ultimate companion to the final film in the acclaimed trilogy. BRIAN SIBLEY is a writer and broadcaster with a life-long interest in fantasy books and cinema. His fascination with J. R. R. Tolkien and the myths and history of Middle-earth led to his critically acclaimed BBC radio dramatisation of The Lord of the Rings in which the role of Frodo was played by Ian Holm, who now portrays Bilbo in Peter Jackson’s The Lord of the Rings Trilogy. Brian’s subsequent radio dramas included several of Tolkien’s short novels collected under the title Tales from the Perilous Realm, C. S. Lewis’ The Chronicles of Narnia, two series of Tales of the Bizarre by Ray Bradbury and Mervyn Peake’s Titus Groan and Gormenghast which won him the prestigious Sony Radio Award. His books include Three Cheers for Pooh, Chicken Run: Hatching the Movie, Cracking Animation, The Disney Studio Story, The Land of Narnia and Shadowlands, as well as the text accompanying three maps by John Howe based on Tolkien’s The Hobbit, The Lord of the Rings and The Silmarillion.